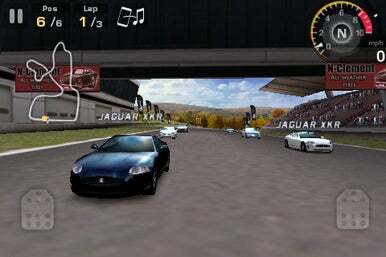 GT Racing: Motor Academy is an intense, highly-detailed racing simulation that will thrill gearheads. Developed by Gameloft, this racing title is a little on the expensive side—but the attention to detail and the wealth of tracks and cars ensures that GT Racing is money well spent. The Jaguar XKR in all its glory. There are three modes: career mode, in which you play through a career from start to finish (including taking license tests); arcade mode, if you just want to jump right in; and multiplayer mode, which features local (using Bluetooth or Wi-Fi) and online play. On iPhone 3GS and third generation iPod touches, up to ten people can race simultaneously—on older models, only six can race at one time. While jumping straight into the game via arcade mode is an attractive option, you’ll eventually have to pay your dues in career mode. With each race in career mode, you’ll earn credits with which to purchase new cars and parts. Your purchased cars and parts will then make their way into the multiplayer and arcade mode, where you’ll be able to use them for subsequent races. The default controls feature the tilt-method of navigation, with an on-screen brake and gas pedal. The tilt-control was very easy to get used to, and can be fully calibrated and customized in the options menu. The mechanics of the game are very impressive, and you can tweak your racing experience by purchasing parts or toggling on driving aides. This is great for both racing geeks and casual players alike—while you can hyper-customize your experience, you can also set it to automatic brakes and gas and just cruise through the game. If you’re not big on using the tilt-method of navigation, there’s also an optional steering wheel. It's perhaps unfortunate irony that a game built on speed is so slow between levels. This was especially annoying in career mode, where you have to go through several short license tests to earn each of your C-, B-, A-, and S-class licenses—I spent nearly as much time waiting for the levels to load as I did playing the levels themselves. GT Racing: Motor Academy is not exactly for the casual racing gamer, but it’s a great simulation for a more involved player. The ability to un-customize the experience (by toggling racing aides on, etc.) means that the casual gamer will still have fun, though some of the fun details (e.g. each of the 100+ cars has its own unique sound effects) may be lost. There are over 100 cars from 24 different manufacturers, including the as-of-yet unnamed Jaguar, the Nissan GT-R, and, my favorite, the Shelby GT 500.